The World Association of Girl Guides and Girl Scouts is updating its image with a number of new achievement badges aimed at encouraging young women into science and technology. My memories of the Girl Guides involve marshmallow toasting, tying knots and being assessed on my table-laying skills for a badge no doubt long-consigned to the archives. Fast forward some 25 years and it's clear much has changed. In an international organisation that liaises with Google and Microsoft among others, today's young guides are just as likely to be gathered round an engineering bench as a campfire. 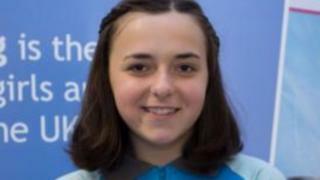 Sixteen-year-old Catherine Young is on a mission to boost girls' interest in engineering and has found the Girl Guides a valuable platform for her campaign. She surveyed girls aged 11-18 and found that 74% didn't have the opportunity to take the subject at school. As part of the Girl Guide Scotland Action for Change project, she is lobbying MPs to make the subject more readily available across all UK schools. "Having a national stage for my project has been incredible as this is something I'm very passionate about," she says. "There is a huge lack of female engineers due to the subject not being available, or girls not knowing about it, and we need more females to bring new ideas that could solve Earth's biggest problems." As the battle to engage girls with Stem subjects - science, technology, engineering and maths - extends beyond the classroom, attention is turning to the role this 106-year-old movement has to play in cultivating this interest. The World Association of Girl Guides and Girl Scouts has a presence in 146 countries and is busy forging links with tech companies and organisations across the globe. For example, guides in Tanzania have hooked up with Techchix, a non-profit body that promotes science and engineering to girls at local secondary schools through mentoring programmes. And in India, girls have teamed up with US-based artificial intelligence giant, Nvidia, to boost female employability in the tech sector. Piloted in the city of Pune, the Screen Girls project aims to deliver computer courses to 400 girls who have recently completed secondary school education. If successful, the project will be extended to other parts of the country. "Every country will have different approaches and where there is success we will showcase it to the rest of the world," says Anita Tiessen, chief executive of the World Association of Girl Guides. "In the US, for example, there has always been a very strong outdoors culture, so they introduce Stem activities in this way through robot camps and Stem field trips." A forthcoming overhaul of achievement badges is likely to see Coding and Mechanics added to the list. Google is currently advising on the delivery of a new Web and App Design badge. In the UK, the main Stem-related badges are Science and Communicator. Girlguiding UK's recent survey with Microsoft found that many members did not see technology as a potential career option, their views influenced by enduring gender stereotypes. "It is a concern that many girls think of Stem as boys' subjects and don't identify any female role models in this area," says Angie Pitt, head of Girlguiding youth programmes. "We have to think about what we can do to counter this, and the first thing is offering a space where they can learn about these subjects in a way that is fun, accessible and relevant to them - and doesn't feel like school or that they're being judged." Projects with Rolls-Royce and BAE systems have led to the development of new "science investigator" and "engineering" badges - while cloud computing specialist Salesforce recently ran a weekend workshop for 200 guides in London. Charlotte Finn, Salesforce's vice president of programs, says: "Aspects of the school curriculum are rooted in the past and are simply not pairing young people with the skills they need for today's jobs in technology. "So it's important that organisations like us complement formal education by bringing these skills to the forefront." Salesforce also helped develop a volunteer recruitment app for the US Girl Scouts. Ellie Overland, senior lecturer in computing education at the UK's Manchester Metropolitan University, recently developed a Computing badge with 30 guides. "I have a son in the Scouts and daughter in the Brownies and I noticed a difference in the technology-related badges on offer," she says. "The Scouts badges seemed to get into the nitty-gritty of computing, while in the Guides the focus was more about online image and e-safety, so I felt it was important with this badge to drill deeper and include components on networks, data and algorithms." While evolution is inevitable in an institution with a 100-plus year heritage, Ms Tiessen believes much of the progress in this area will be underpinned by the movement's core values of girl-led learning and leadership. "In many countries around the world there are very few opportunities for girls to have that 'safe space' to develop their skills and leadership opportunities," she says. "And with all the evidence pointing to girls holding back in more mixed environments, we are giving girls greater freedom to explore those things." Ever since a small group of girls gate-crashed the first ever Scout rally in 1909 demanding "something for the girls", girl guides have been challenging the status quo. More power to their elbows.